Harmony@Workplaces Photo Contest: Win over $3,000 worth of cash prizes! Singapore is a melting pot of cultures, and thus, it is a norm now to have colleagues of different races, religions and cultural backgrounds in our workplaces. There is no where else other than Singapore where it is common for us to be talking in English with our colleagues in a meeting, conversing in Chinese during lunchtime and then hangout with our "Abangs" after work. Back for the third year, the Harmony@Workplaces Photo Contest aims to reach out to the public and encourage harmony and camaraderie between colleagues of different races and religions at their workplaces. And this year, winners will stand to win over $3000 worth of cash prizes! Whooo! THAT'S IT. IT'S THAT SIMPLE TO WIN $3,000! 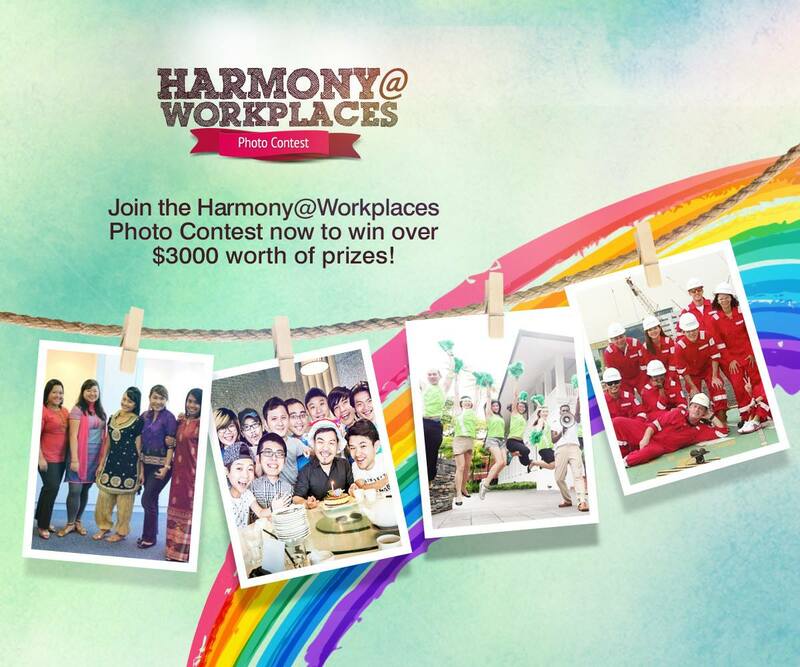 The Harmony@Workplaces Photo Contest is open to all working adults in Singapore aged 18 and above, and the contest will end on 26 June 2015. (a) Social Photo Booth: Pose for photos with attractive SG50 themed props. The photos can be uploaded onto the Harmony@Workplaces Facebook page to participate in the photo contest. And of course, bloggers being bloggers, we went straight to the photobooths for some photos! (b) Kampong Snack Challenge: Participants were invited to take part in the game of Kampong Snack Challenge, featuring local ethnic delights such as “Muah Chee” and “Kueh Lapis”, and they walked away with prizes on the rainbow wheel! (c) Goodie Bags: Goodie bags containing a customised Harmony@Workplaces ez-link card featuring the top winning photo from last year’s contest, USB fan, automatic umbrella and Bluetooth speaker/laptop sleeve/power bank/travel adaptor were redeemed by the first 100 participants who submitted their photos for the contest. Those who “liked” the Harmony@Workplaces Facebook page also got a free ice-cream to cool off the heat! In summary: almost everyone who stopped by the Harmony @ Worlplaces outdoor booth walked away with goodie bags, prizes and ice-cream! Besides the photo contest, there will also be exciting daily posts and weekly quizzes uploaded on the Harmony@Workplaces Facebook page to draw your colleagues together to participate in the Facebook activities! Last I saw, they are giving away $40 Capitamall vouchers in their latest "Happy Monday Quiz", and it is soooo easy to participate. 1. Like Harmony@Workplaces Facebook page and look out for their posts and quizzes! 2. Participate in the photo contest by submitting photographs that display camaraderie and team spirit at work on the Harmony@Workplaces Facebook page as well. Stand to win over $3,000 worth of cash prizes! Remember, contest ends on 26 June 2015. So gather your colleagues, take a photo together, and hopefully, you will be one of the winners of the awesome cash prizes! Good luck!